The Tax Cuts and Jobs Act (TCJA) has brought with it numerous questions from taxpayers and business owners. Careful planning is critical as we guide clients through the best decisions. In this edition of our newsletter, we share a reminder on retirement contribution deadlines, the latest information for landlords and 1099s, a payroll withholding reminder, business advice and much more. Our goal is to provide you with an unparalleled level of client service. If you see something that you want to talk about, please contact us to explore the possibilities. We rely on satisfied clients as the primary source of new business, and your reviews and referrals are both welcomed and most sincerely appreciated! Have you been ignoring your future retirement needs? This tends to happen when people are young; because retirement is far in the future, they believe that they have plenty of time to save for it. Some people even ignore the issue until late in life, which causes them to scramble to fund their retirement. Others even ignore the issue altogether, assuming that they will qualify for Social Security and that the resulting income will take care of their retirement needs. Did you know that you can make retirement savings contributions after the close of the tax year and that these contributions may be deductible? With the April tax deadline in the near future, the window of opportunity is closing to maximize contributions to retirement and special-purpose plans for 2018. Many of these retirement contributions will also deliver tax deductions or tax credits for the 2018 tax year. Contribution Opportunities – Some 2018 retirement contributions are available after the close of the year. Traditional IRAs – For 2018, the maximum traditional IRA contribution is $5,500 (or $6,500 if the taxpayer is at least 50 years old on December 31, 2018). A 2018 traditional IRA contribution can be made until April 15, 2019. However, for taxpayers who have other retirement plans, some or all of their IRA contributions may not be deductible. To be eligible to contribute to IRAs (of any type), taxpayers—or spouses if married and filing jointly—must have earned income such as wages or self-employment income. Roth IRAs – A Roth IRA is a nondeductible retirement account, but its earnings are tax-free upon withdrawal—provided that the requirements for the holding period and age are met. Roth IRAs are a good option for many taxpayers who aren’t eligible for deductible contributions to a traditional IRA. For 2018, the contribution limits for a Roth IRA are the same as for a traditional IRA: $5,500 (or $6,500 if the taxpayer is at least 50 years old). A 2018 Roth IRA contribution can also be made until April 15, 2019. Caution: For those who have both traditional and Roth IRA contributions, the combined limit for 2018 is also $5,500 (or $6,500 if the taxpayer is at least 50 years old). Spousal IRA Contributions – A nonworking spouse can open and contribute to a traditional or Roth IRA based on the working spouse’s earned income. The spouses are subject to the same contribution limits, and their combined contributions cannot exceed the working spouse’s earned income. Spousal IRA contributions for 2018 must also be made by April 15, 2019. Simplified Employee Pensions IRAs – Simplified Employee Pension IRAs are tax-deferred plans for sole proprietorships and small businesses. This is probably the easiest way to build retirement dollars, as it requires virtually no paperwork. The maximum contribution depends on a business’s net earnings. For 2018, the maximum contribution is the lesser of 25% of the employee’s compensation or $55,000. A 2018 contribution to such a plan can be made up to the return’s due date (including extensions). Thus, unlike a traditional or Roth IRA, a Simplified Employee Pension IRA can be established and funded for 2018 as late as October 15, 2019 (if an extension to file a 2018 Form 1040 has been granted). Solo 401(k) Plans – A growing number of self-employed individuals are forsaking the Simplified Employee Pension IRA for a newer type of retirement plan called a Solo 401(k) or Self-Employed 401(k). This plan is available to self-employed individuals who do not have employees, and it is notable mostly for its high contribution levels. For 2018, Solo 401(k) contributions can equal 25% of compensation, plus a salary deferral of up to $18,500. The total contributions, however, can’t exceed $55,000 or 100% of compensation. Note that an individual must have established the Solo 401(k) account by December 31, 2018, to make 2018 contributions. However, contributions to an established account can then be made up to the return’s due date (which can be extended to October 15, 2019, for most taxpayers). Taxpayers who did not establish a Solo 401(k) account by the end of 2018 can still open one now for 2019 contributions. Health Savings Accountants – Health savings accounts are only available for individuals who have high-deductible health plans. For 2018, this refers to plans with a deductible of at least $1,350 for individual coverage or $2,700 for family coverage. These accounts allow individuals to save money to pay for their medical expenses. Money that an individual does not spend on medical expenses stays in that person’s account and gains (tax-free) interest, just like in an IRA. Because unused amounts remain available for later years, health savings accounts can be used as additional retirement funds. The maximum contributions for 2018 are $3,450 for individual coverage and $6,900 for family coverage. The annual contribution limits are increased by $1,000 for individuals who are at least 55 years old. Contributions to a health savings account for 2018 can be made through April 15, 2019. Please note that the information provided above is abbreviated. Contact this office for specific details on how each option applies to your situation. Saver’s Credit – Low- and moderate-income workers are eligible for a saver’s credit that helps them offset part of the first $2,000 that they contribute to an IRA or a qualified employer-based retirement plan. This credit helps individuals who don’t normally have the resources to set money aside for retirement, and it is available in addition to the other tax benefits that are associated with retirement-plan contributions. This credit is provided to encourage taxpayers to save for retirement. To prevent taxpayers from taking distributions from existing retirement savings and then re-depositing them to claim this credit, the qualifying retirement contributions used to figure the credit are reduced by any retirement-plan distributions taken during a “testing period”: the prior two tax years, the current year, and the portion of the subsequent tax year up to the return’s due date (including extensions). Children with Earned Income – Many children hold part-time jobs, and after the recent tax reform, the standard deduction allows these children to earn $12,000 tax-free. This earned income also qualifies children for IRA contributions. Although children may balk at contributing their hard-earned income to an IRA, their parents or grandparents can gift Roth IRA contributions to children. That Roth IRA will significantly increase in value by the time the child reaches retirement age, 45 or 50 years later. Individuals’ financial resources, family obligations, health, life expectancy, and retirement expectations vary greatly, and there is no one-size-fits-all retirement strategy. Events such as purchasing a home or putting children through college can limit retirement contributions; these events must be accounted for in any retirement plan. If you have questions about any of the retirement vehicles discussed above or if you would like to discuss how retirement contributions will affect your 2018 tax return, please give this office a call. Unfortunately, the reverse is also true as NSBA revealed that the greatest challenge to both small business growth and survival is economic uncertainty. That idea in and of itself may be nothing new, but a number of recent studies and surveys have revealed that a slowdown in the economy is an issue that may be significantly more timely than many realize. According to the latest CNBC/SurveyMonkey survey, 53 percent of respondents say that they expect an economic recession sooner rather than later. In fact, many of them think that it could arrive as soon as 2020. This comes despite the fact that 52 percent of respondents described business conditions as “good” for the first quarter of 2019; 57 percent expect increased revenue; and 28 percent actually plan to increase their own full-time staff in the short term. One of the major factors that contributed to the devastation wreaked by the last recession was that it was so sudden. Things got very bad very quickly, and a lot of small business owners suffered as a result. Experts agree that one of the best ways to make sure that your small business comes out of the next economic slowdown in one piece has to do with being as proactive and as prepared as possible. Your business might not need a working capital injection today, for example, but it may once the next recession begins. At that point, it might be difficult to gain access to that capital thanks to poor or uncertain economic conditions. To combat this, consider taking out a new line of credit to help make sure those funds are available if and when the time comes. Getting a credit line for $20,000 doesn’t mean that you have to borrow that money today or even in full. But the peace of mind that comes with knowing you do have access to these funds will go a long way toward making sure that you can stay afloat during those slow periods. When the economy does slow down, you’ll need to make sure that your cash flow is in order. If that is currently a problem for you, it’s only going to get worse as time goes on. Make an effort today to collect on accounts receivable at a faster pace. Improve and optimize your own processes and workflows to make sure that you’re getting the money for services rendered as quickly as possible. If you take meaningful steps to improve your cash flow situation now, it will be one less thing you have to worry about if the economy does slow down dramatically next year. Finally, one of the best steps you can take to protect your business during slow economic periods has to do with performing an overhaul of your inventory management practices. Inventory costs are always a major pain point for most small businesses, but this is especially true during a recession. Again, take a look at some of the problems you may have today that could cause major damage down the road. Do you currently order far too many of one specific item? Is there an item that you have that can be sourced somewhere else for a better price? Are you capitalizing on every opportunity to reduce shipping and warehousing costs? These are the types of questions you need to ask yourself prior to the next economic slow period. If you wait until things start to get tough before taking a look at your inventory management practices, you’ll have waited far too long. You may be able to make progress at that time, but the lion’s share of the serious damage will have already been done. However, by following tips like these to strengthen the foundation of your business right now, it will still be as solid as you need it to be moving forward – regardless of what happens with the economy during that time. If nothing else, these steps will all help to make sure that your business comes out of the next recession stronger than ever, which is definitely the position you want to be in. It is not uncommon to have a repairman out early in the year, pay him less than $600, then use his services again later and have the total for the year exceed the $600 limit. As a result, you might overlook getting the information needed to file the 1099s for the year. Therefore, it is good practice to always have individuals who are not incorporated complete and sign the IRS Form W-9 the first time you use their services. Having a properly completed and signed Form W-9 for all independent contractors and service providers will eliminate any oversights and protect you against IRS penalties and conflicts. The government provides IRS Form W-9, “Request for Taxpayer Identification Number and Certification,” as a means for you to obtain the data required from your vendors in order to file the 1099s. It also provides you with verification that you complied with the law, should the individual provide you with incorrect information. We highly recommend that you have a potential vendor or independent contractor complete a Form W-9 prior to engaging in business with him or her. Many small business owners and landlords overlook this requirement during the year, and when the end of the year arrives and it is time to issue 1099-MISCs to service providers, they realize they have not collected the required documentation. Often, it is difficult to acquire the contractor’s, handyperson’s, gardener’s, etc., information after the fact, especially from individuals with no intention of reporting and paying taxes on the income. This has become even more important in light of the tax reform’s 20% pass-through deduction (Sec. 199A deduction), since the regulations for this new tax code section caution landlords that to be treated as a trade or business, and therefore to be generally eligible for the 199A deduction, they should consider reporting payments to independent contractor service providers on IRS Form 1099-MISC, which wasn’t generally required for rental activities in the past and still isn’t required when the rental is classified as an investment rather than as a trade or business. This caution was included in IRS regulations issued after the close of 2018, which caught everyone by surprise and left most rental property owners to deal with obtaining W-9s after the fact from service providers and issuing the 1099-MISCs after the due date of January 31, 2019. For each 1099-MISC form filed after the January 31, 2019 due date but within 30 days there is a penalty of $50. After 30 days and by August 1, 2019 the penalty increases to $100 per 1099-MISC and those filed after August 1, 2019 the penalty jumps to $270 per 1099-MISC. These penalties do have maximum amounts. 1099-MISC forms must be filed electronically or on special optically scannable forms. If you need assistance with filing 1099-MISCs or have questions related to this issue, please give this office a call. Also, make sure you have all of your independent contractors or service providers complete a Form W-9 for 2019. Thanks to the tax reform, beginning in 2019, the penalty for not having adequate health insurance, which the government refers to as the “individual shared responsibility payment,” will no longer apply. The elimination of this penalty as of 2019 does not impact the health care subsidy for low-income families, which is known as the premium tax credit and which is available for policies acquired through a government insurance marketplace. This elimination also does not affect the penalties assessed on employers that do not offer affordable insurance to employees and that have 50 or more full-time-equivalent employees. However, the penalty still applies for individual taxpayers who did not have minimum essential health coverage for 2018 and is the greater of the sum of the family’s flat dollar amounts or 2.5% of the amount by which the household’s income exceeds the income-tax-filing threshold. For 2018, the flat dollar amounts are $695 per year ($57.92 per month) for each adult and half that amount ($347.50; $28.96 per month) for each child under the age of 18; the maximum family penalty using this method is $2,085 per year ($173.75 per month). As an example, say that a family of four (2 adults and 2 children) has a household income that exceeds the income-tax-filing threshold by $100,000. This family would have a maximum penalty equal to the greater of the flat dollar amount ($695 + $695 + $347.50 + $347.50 = $2,085) or 2.5% of the income amount (2.5% × $100,000 = $2,500). Thus, the maximum penalty would be $2,500. However, the penalties are applied separately per month, and they do not apply in a given month if certain exceptions are met. There are a number of exceptions to the penalty, as listed below. For details related to qualifying for any of these exceptions, please give this office a call. Some of the penalty exceptions apply to the entire year, and some only apply to a specific month in the year. If penalty relief applies to a specific month, it also applies to the months just preceding and following that month. The table below lists the various exceptions and the code number the government assigned to that exception. Evicted or facing eviction because of foreclosure. Received a shut-off notice from a utility company. Death of a family member. Fire, flood or other disaster that caused substantial damage. Medical expenses could not cannot be paid, resulting in substantial debt. Increased necessary expenses to care for an ill, disabled or aging family member. Ineligible for coverage because state didn’t expand Medicaid. Financial or domestic circumstances, including an unexpected natural or human-caused event, causing an unexpected increase in essential expenses, which prevented obtaining coverage under a qualified health plan. The expense of purchasing a qualified health plan would have caused the taxpayer to experience serious deprivation of food, shelter, clothing or other necessities. To claim a hardship exemption, an individual must obtain an ECN through the normal application process, or for 2018, they may self-certify the hardship. However, an individual who is self-certifying is cautioned to retain documentation that demonstrates qualification for the hardship exemption, in case it is later challenged by the IRS. A person is eligible for a hardship exemption for at least the month before, the month(s) during and the month after the specific event or circumstance that created the hardship. This may all seem complicated; however, this office can assist you with avoiding the lack-of-health-insurance penalty. Please call with any questions you might have. The Tax Cuts and Jobs Act of 2018 and other tax reforms have brought about significant changes in the way that vehicle use is deducted for business purposes. Before getting into these changes, it is appropriate to first provide a review of the two methods for deducting the use of a business vehicle. Vehicle Depreciation– The so-called luxury-vehicle rules limit the annual depreciation deduction for vehicles that weigh 6,000 pounds or less. The recent tax reform substantially increased these limits by providing much larger first- and second-year deductions for more expensive vehicles. The table below displays the limits for vehicles that were placed into service in 2018. These rates will be adjusted based on inflation in future years. Business-Vehice Sales or Trade-ins – Under prior law, a good tax strategy was to trade in a vehicle instead of selling it if the sale would result in a gain, as this would defer the gain into the replacement vehicle and thus avoid tax on the gain. Conversely, it was good practice to sell a vehicle for a loss so as to take advantage of the tax loss. Unfortunately, since the recent tax reform, tax-deferred exchanges are no longer allowed, except for real estate. The aforementioned strategies are thus no longer valid, and all vehicle trade-ins are treated as sales: Any gain is taxable, and any loss is deductible. However, if a vehicle is used solely for personal purposes, a loss from a sale is not deductible; if a vehicle is used for both business and personal reasons, then only the business portion of a loss on a sale is deductible. The tax rules for business vehicles can be quite complicated. To maximize your benefits, please contact this office for assistance. If your tax refund is less than you anticipated, you are not alone. In a report issued by the Treasury Department on February 14, the average refund it is paying in 2019 has dropped to $1,949 from $2,135 in the prior year. In addition, the number of returns filed so far has dropped from 13.5 million last year to 11.4 million this year for the same period. With all the hype about how tax reform would reduce taxes, taxpayers were anticipating larger refunds this year but instead are receiving less, on average. This has left the Republican lawmakers who passed the tax reform scrambling to explain why the refunds are lower . Although most taxpayers will actually pay less in taxes this year, this does not necessarily translate into increased refunds. For most, the tax cut provided more take-home pay during 2018, instead of adding to their refunds at the end of the year. This decrease in withholding spread over 52, 26 or 24 paychecks is far less noticeable than a lump sum added to the refund. How did this happen? The culprit is generally the amount of tax you had withheld from your paycheck each payday. The tax reform was passed at the very end of 2017, not allowing the IRS sufficient time to adjust the employer withholding tables or the W-4 — Employee’s Withholding Allowance Certificate — for the new law. When they did a couple of months later, the revised withholding tables and W-4 produced lower withholding, leading to the lower refunds. The IRS was aware of this and issued notices almost weekly cautioning taxpayers that the lower withholding would lead to lower refunds or perhaps even them owing instead of receiving a refund. The General Accounting Office estimates that the number of taxpayers who will owe taxes this year will increase from 18 to 21 percent. If you are affected and want to avoid the same thing from happening next year, you may want this office to compare your current withholding to your projected tax liability so that you can adjust your withholding to produce the result you desire on your 2019 return. 1. Home Rented for Fewer Than 15 Days — If a property is rented out for fewer than 15 days in a year, the property is treated as if it were not rented out at all: The rental income is tax-free, and the interest and taxes paid on the home are still deductible. In this situation, however, any directly related rental expenses (such as agent fees, utilities, and cleaning charges) are not deductible. This rule can allow for significant tax-free income, particularly when a home is rented as a filming location. 2. Home Rented For At Least 15 Days With Minor Personal Use — In this scenario, the home is rented for at least 15 days, and the owners’ personal use of the home does not exceed the greater of 15 days or 10% of the rental time. The home’s use is then allocated as both a rental home and a second home. For example, if a home is used 5% of the time for personal use, then 5% of the interest and taxes on that home are treated as home interest and taxes; these costs can be deducted as itemized deductions. The other 95% of the interest and taxes, as well as 95% of the insurance, utilities, and allowable depreciation, count as rental expenses (in addition to 100% of the direct rental expenses). The combined expenses for all rental activities are deductible as a tax loss. However, this amount is limited to $25,000 per year for a taxpayer with adjusted gross income of $100,000 or less and is ratably phased out between $100,000 and $150,000. Thus, if a taxpayer’s income exceeds $150,000, the rental-expense tax loss cannot be deducted; it is carried forward until the home is sold or until gains from other passive activities can be used to offset the loss. 3. Home Rented For At Least 15 Days With Major Personal Use — In this scenario, a home is rented for at least 15 days, but the owner’s personal use exceeds the greater of 14 days or 10% of the rental time. With such major personal use, no rental-related tax loss is allowed. For example, consider a home that has personal use 20% of the time and is a rental for the remaining 80%. The rental income is first reduced by 80% of the combined taxes and interest. If the owner still makes a profit after deducting the interest and taxes, then direct rental expenses and certain other expenses (such as the rental-prorated portion of the utilities, insurance, and repairs) are deducted, up to the amount of the remaining income. If there is still a profit, the owner can take a deduction for depreciation, but this is also limited to the remaining profit. As a result, no loss is allowed, and any remaining profit is taxable. The interest and taxes from the personal use (20% in this example) are deducted as itemized deductions, which are subject to the normal interest and tax limitations. 4. Vacation Home Sales — A vacation-home rental is considered a personal-use property. Gains from the sales of such properties are taxable, and losses are generally not deductible. Unlike primary homes, second homes do not qualify for the home-gain exclusion. Any gain from a second home is taxable unless it served as the taxpayer’s primary residence for two of the five years immediately preceding the sale and was not rented during that two-year period. In the latter scenario, the taxpayer does qualify for the home-gain exclusion, provided that he or she has not used that exclusion for another property in the prior two years. As a result, by the home-gain exclusion can offset an amount of gain that exceeds the depreciation previously claimed on the home; this amount is limited to $250,000 for an individual or $500,000 for a married couple filing jointly (if the spouse also qualifies). There are complicated tax rules related to the home-gain exclusion for homes that are acquired in a tax-deferred exchange or converted from rentals to primary residences. Homeowners may require careful planning to utilize the home-gain exclusion in such cases. As an additional note, when a property is rented for short-term stays or when significant personal services (such as maid services) are provided to guests, the taxpayer likely will be considered a business operator rather than just an individual who is renting a home. If so, the reporting requirements will differ from those outlined above. As with all tax rules, there are certain exceptions to be aware of. Please call this office to discuss your situation in detail. Mortgage Interest– Prior to the tax reform, a taxpayer could deduct the interest he or she paid on up to $1 million of acquisition debt and $100,000 of equity debt secured by the taxpayer’s primary home and/or designated second home. This interest was claimed as an itemized deduction on Schedule A of the homeowner’s tax return. This tax deduction was often cited as one of the reasons to purchase a home, rather than renting a place to live. Equity Debit: Under the new law, equity debt interest is no longer deductible after 2017, and this even applies to interest on existing equity debt, essentially pulling the rug out from underneath taxpayers who had previously taken equity out of their homes for other purposes and who were benefiting from the itemized deduction. Note: Equity debt used to purchase, construct or substantially improve one’s home or second home is not treated as equity debt for tax purposes, it is instead treated as acquisition debt (See acquisition debt limits above). Property Taxes: – Prior to the tax reform, homeowners could deduct all of the state and local taxes they paid as an itemized deduction on their federal return. These taxes were primarily real property taxes and state income tax (taxpayers had and still have the option to replace state income tax with sales tax). Beginning in 2018 and through 2025, the deduction for taxes is still allowed but will be limited to a total of $10,000. Thus, if the total property tax and state income tax exceeds $10,000, homeowners may not get the benefit of deducting the full amount of the property taxes they paid. In addition, this requires an analysis when the return is being prepared of whether to claim sales tax instead of state income tax, since when state income tax is deducted, if there’s a state tax refund, it may be taxable on the federal return for the year when the refund is received. Yes, it’s true that we’re just coming out of the longest government shutdown in the history of the United States. It will take many government agencies – including the Internal Revenue Service – a significant period of time to get back up to speed. But if you think that all this means that the chances of your getting audited are lower than ever, you’re going to want to think again. According to one recent study, the IRS audited about 0.6 percent of individual tax returns in 2016, which means that your chances of getting that unfortunate letter in the mail were about one in 160. When you expand the definition of a traditional audit to include all of the other types of notices that you may receive to re-examine your taxes or provide backup documentation, for example, that number jumps to about 6.2 percent— or roughly one in 16. So not only were your chances of getting audited always higher than you thought, but a government shutdown isn’t going to prevent this particular train from running on time. There are a few common IRS audit red flags in particular that you’ll want to know more about as April approaches once again. A lot of people don’t realize just how much of the IRS’s own processes are automated. When you file your income tax return, that information gets entered into a computer, and a lot of the processing is done before a human ever looks at it — if one ever comes into contact with your return at all. Therefore, one of the major red flags that will certainly trigger an audit are math errors, because a computer doesn’t care whether the government was shut down or not. A math error is a math error, and if you make one (or multiple), it’ll send up a red flag within the IRS’s system, and an automated notice will likely be issued as a result. The people who work for the IRS aren’t amateurs; they know that certain types of industries feature more instances of unreported cash earnings than others. This is why another one of the major red flags that could see you on the receiving end of an IRS audit has to do with the industry you’re operating in to begin with. If you work in the restaurant industry where cash tips are common, for example, you are probably always going to garner more attention from IRS professionals than someone who may have a more rigid salary. Simply being a part of these types of industries automatically raises your odds of being audited, and no government shutdown is going to change that. In 2018, the IRS actually came right out and admitted that people who claim the Earned Income Tax Credit are twice as likely to be audited than those who don’t. A large part of this comes down to the fact that people sometimes take this credit who shouldn’t, and it costs the United States government about $10 billion per year. .
At this point, it’s important to note that taking this credit intentionally when you shouldn’t is fraud, and that is not a situation you want to find yourself in. If you can prove that you took the credit by accident, you don’t necessarily have anything to worry about. But you’ll likely still be audited, and you’re certainly going to have some explaining to do. Finally, one of the biggest red flags that the IRS always looks for when determining whom to audit ultimately comes down, not to charitable contributions as a concept, but to significantly large contributions under peculiar circumstances. When viewing charitable contributions, the IRS always looks at the amount you gave relative to the overall amount you made during a year. The IRS definitely knows, on average, how much people in certain income brackets are likely to donate. Sure, there are always special circumstances – but if you give two years’ worth of donations in a single year in an effort to maximize the deduction you can take, you’re almost always going to attract the type of attention you don’t necessarily want. Provided that you’ve got the documentation to back up your donations, you have absolutely nothing to worry about. But a lot of people try to game the system by saying that they gave X amount of dollars in one year when they really gave that money over the last few years, and that is something the IRS will try to put a stop to. An audit isn’t necessarily a bad thing, especially if you have the documentation to support every move you made and why it was the right one for you at the moment. But again, don’t assume that the government shutdown means that your chances of an IRS audit are practically zero. They never were, but they certainly aren’t now, which is why you’ll always want to make sure that you’ve crossed your T’s and dotted your I’s before you submit your tax return information this year. Could Your Sales Invoices Be Better? How QuickBooks Online Can Help. Every interaction with your customers can enhance your image. Here’s how QuickBooks Online contributes to that. Getting paid by your customers—on time, and in full—can take some effort on your part. You set smart due dates and enforce them. Price your products and services so they’re both reasonable and profitable. Accept online payments. But are your invoices working for you here? QuickBooks Online provides sales form templates that you can usually use without modifying. But it also offers tools that support multiple kinds of customization. It helps you shape the content and appearance of your invoices and their accompanying messages to be consistent with your company’s brand. These may be cosmetic changes, but they can affect the way customers react to communications from you. You have few chances to make an impression, so anything you can do to enhance and personalize every interaction will have impact on their impression of you. Neat, well-designed sales forms convey professionalism and attention to details. Here’s a look at what you can do. Unless you use every single field in QuickBooks Online’s default sales form template, your invoices will look sloppier than they might otherwise. The site gives you control over much of the content that your customers will see. To make changes, click the gear icon in the upper right of the screen and select Account and Settings, then Sales. You’ll see Sales form contentin the left column. Click on any of the fields to the right to open a more thorough list of options. QuickBooks Online lets you turn fields on and off in your sales forms and specify other preferences. Click on the status (On, Off) in the right column to change it. When you’re satisfied with your selections, click Save. Then close that window by clicking the Xin the upper right corner. You have more options than these. Click the gear icon again, and then Your Company | Custom Form Styles. You’ll see that there is already a “master” form. You can either edit it or create a new one.We recommend leaving the master form alone so you always have a clean copy to consult if you get tangled up while you’re working. Click the down arrow in the New style box in the upper right and select Invoice. In the screen that opens, enter a descriptive name for your template in the field at the top and then click Content. 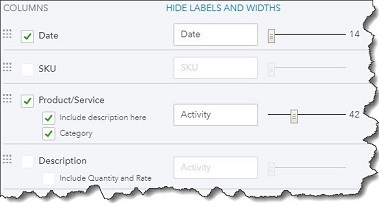 A graphical representation of your invoice will appear in the right pane, grayed out. It’s divided into three sections: header, footer, and table (the middle of the invoice where you describe what you sold). Each displays a small pencil icon on the right side of the screen. Click the one in the middle to make that area more visible. It’s easy to specify which fields should appear on your invoices, what the labels should say, and how wide the space should be. As you check and uncheck boxes to indicate what content should be included, your invoice on the right will change to reflect your actions. You can Preview PDF by clicking that button in the lower right. When you’re satisfied with the changes you’ve made to all three sections, click on the Design tab. Select a color scheme and fonts. You have control over the messages that go out with your invoices. Finally, click the Emails tab. 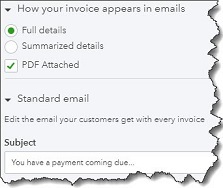 Options here let you customize the emails that are sent to customers along with their invoices. Again, changes you make in the left pane will be reflected in the graphical version on the right side. When you’ve completed all of your modifications, click Done. We gave you this whirlwind tour of QuickBooks Online’s invoice customization options so you’d know what was possible. We expect you might need some assistance when you sit down to apply the concepts you’ve learned about to your own company’s sales forms. We’re available to help you present a polished, carefully-crafted image representing your brand to your customers. If you are an employee who works for tips and received more than $20 in tips during February, you are required to report them to your employer on IRS Form 4070 no later than March 11. Your employer is required to withhold FICA taxes and income tax withholding for these tips from your regular wages. If your regular wages are insufficient to cover the FICA and tax withholding, the employer will report the amount of the uncollected withholding in box 12 of your W-2 for the year. You will be required to pay the uncollected withholding when your return for the year is filed. It is only one month until the April due date for your individual income tax returns. If you have not made an appointment to have your taxes prepared, we encourage you to do so before it becomes too late. Do not be concerned about having all your information available before making the appointment. If you do not have all your information, we will simply make a list of the missing items. When you receive those items, just forward them to us. Even if you think you might need to go on extension, it is best to prepare a preliminary return and estimate the result so you can pay the tax and minimize interest and penalties. We can then file the extension for you. File your 2018 income tax return (Form 1040) and pay any tax due. However, you have until April 15 (April 17 if you live in Maine or Massachusetts) to file if you paid your 2018 estimated tax by January 15, 2019. If you’re an Applicable Large Employer, provide the 2018 Form 1095-C, Employer-Provided Health Insurance Offer and Coverage, to full-time employees. The normal due date for giving employees their copy of the 1095-C is January 31, 2019, but the IRS gave a blanket extension of 30 days to ALEs for 2019 filings. File a 2018 calendar year return (Form 1065). Provide each partner with a copy of Schedule K-1 (Form 1065), Partner’s Share of Income, Deductions, Credits, etc., or a substitute Schedule K-1. If you want an automatic 6-month extension of time to file the return and provide Schedules K-1 or substitute Schedules K-1 to the partners, file Form 7004. Then, file Form 1065 and provide the K-1s to the partners by September 16. File a 2018 calendar year income tax return (Form 1120S) and pay any tax due. Provide each shareholder with a copy of Schedule K-1 (Form 1120S), Shareholder’s Share of Income, Deductions, Credits, etc., or a substitute Schedule K-1 (Form 1120S). To request an automatic 6-month extension of time to file the return, file Form 7004 and pay the tax estimated to be owed. Then file the return; pay any tax, interest, and penalties due; and provide each shareholder with a copy of their Schedule K-1 (Form 1120S) by September 16. If the monthly deposit rule applies, deposit the tax for payments in February. ©Augustedge Solutions for Success. All Rights Reserved. Created by Augustedge Marketing.